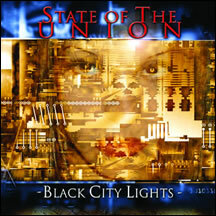 State of the Union set out to defy all boundaries with their debut, Black City Lights. Fusing an intelligent mix of electro, techno, trance and synthpop with Johann's distinctive delivery and emotion has created a sound they can only call their own. Solid from start to finish, Black City Lights is only the beginning of what this band has to offer and provides a glimpse of what is to come in the future.